Since the violin pattern is not diagnostic, and other spiders may have similar marking (i.e. cellar spiders and pirate spiders), for purposes of identification it is far more important to examine the eyes. Differing from most spiders, which have eight eyes, recluse spiders have six eyes arranged in pairs (dyads) with one median pair and two lateral pairs. Only a few other spiders have 3 pairs of eyes arranged this way (e.g., scytodids), and recluses can be distinguished from these as recluse abdomens have no coloration pattern nor do their legs, which also lack spines. Currently, Brown Recluse Spiders do not live in Washington State, they are mainly found in warmer climates, but visitors to this site may be interested to know more about them. Recluse spiders build irregular webs that frequently include a shelter consisting of disorderly threads. These spiders frequently build their webs in woodpiles and sheds, closets, beds, garages, plenum, cellars and other places that are dry and generally undisturbed. They seem to favor cardboard when dwelling in human residences, possibly because it mimics the rotting tree bark which they inhabit naturally. They also tend to be found in shoes, inside dressers, in bed sheets of infrequently used beds, in stacks of clothes, behind baseboards, behind pictures and near furnaces. The common source of human-recluse contact is during the cleaning of these spaces when their isolated spaces are suddenly disturbed and the spider feels threatened. Unlike most web weavers, they leave these webs at night to hunt. 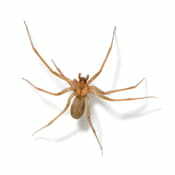 Males will move around more when hunting, while the female spiders tend to remain nearer to their webs.